After a drunken night of dancing on graves, a group of friends are haunted by three havoc-minded ghosts bent on revenge. After the initial scene's action the story slowed down quite a bit till the scene in the graveyard where they dance on the graves. But once that scene was done the movie definitely picked up! I feel that this is a very good ghost story. I wouldn't say the best I ever seen... but definitely enjoyable. There was even a couple things that I really didn't see coming... which is always a good thing! The release has a nice collection of extras including trailers for other releases from the After Dark Horrorfest, Deleted Scenes, Featurettes, Storyboard Comparison, and a commentary. This is one that I feel comfortable recommending to any horror fan. Nominated for six Academy Awards® including Best Picture, this critically acclaimed film remains the #1 thriller of all time. Bruce Willis, in an outstanding and restrained performance, is Dr. Malcolm Crowe, a distinguished child psychologist haunted by his failure to help a former patient. When he meets Cole Sear (Haley Joel Osment), a frightened, confused eight-year-old haunted by a profound secret, they begin a suspense-filled journey of discovery. With a riveting intensity you'll find thoroughly chilling and utterly unforgettable, the revelation of Cole's incredible sixth sense leads them both to mysterious and unforeseeable consequences in this powerful supernatural thriller. I am fully prepared to take some slack on this one... as I know there is several people out there that does not like this movie at all. But this is one I enjoyed every minute of. I first saw this movie with my sister-in-law and niece at the movie theater... and I am a little ashamed to admit this but... I did not see the end twist of this movie coming. It actually did catch me completely off guard. One thing I really liked about this movie is all the hints that was there through-out the whole movie that if you were paying attention you should have seen the twist coming. Which makes it fun to watch for in additional viewings. Once you know what the twist is... and see all the hints in the movie before it... you wonder just how stupid you are for not seeing it the first time. I am fully prepared to take some slack on this one... as I know there is several people out there that does not like this movie at all. Don't worry, I've liked it the first time and not that much the second time. Like all the M. Night Shyamalan's movie made this one rest only on the twist ending and when you know it the film isn't that great or original or interesting. I have watched The Lady in the Water last week; as a rental as it was supposed to be rather weak. ...and it was. Well, I really think now that Shyamalan has lost his whatever he may have had after/with Signs... :shrugs: Anyone seen The Happening? I mean, Come on, the wind? Really? I have to agree with Achim here... I find a high replay value here as well.... as I was saying in the review I liked to be able to see all the hints that was throughout the movie. And as Achim said... the 3 leads were great. I personally haven't seen much of Shyamalan's stuff at all since Signs myself. ...and I don't see a need to change that at all. That's a shame... I really liked his early stuff. The Village is actually quite alright, scary and all, but gets ruined buy the twist. The Lady in the Water is a good basic idea which gets quickly slaughtered by bad choices and taking things one step too far at the end. The Happening, well, again a good basic idea which just gets lost in the second half. I am no longer looking forward to his next film. I haven't seen "The Sixth Sense" for a while now. But I remember that I enjoyed it just as much the second time around. It's fun to see all the hints put throughout the movie. "The Village" on the other hand, I have only seen once so far, and I had guessed the end twist almost from the beginning. I remember when I first heard they were making this movie. All I could say at the time was WHY!?!?! But after watching it I decided that even though a remake wasn't needed... they did a pretty good job on it. I did (and still do) enjoy it. That is not to say it is as good as the original... because there is no way it could be. In the original Vincent Price was perfect in the role... and Geoffrey Rush just didn't cut it in my opinion. I do like how they changed the role name to Stephen Price.... a little homage to Vincent Price there? But other then that it is a decent horror movie.... I would even say above average. After watching the last film I decided to check out this direct to video sequel. I would have to say I enjoyed this movie. Sure it is a turn your brain off... popcorn type horror movie. Being an unrated DVD it is no surprise this movie has it's share of gore. These two movies makes an enjoyable double feature. This is one I haven't watched in a while... but is one I always enjoyed. They mixed the comedy in with this ghost story very well. I think everyone done a great job in this movie... but I have to give an extra thumbs up to the job Jeffrey Combs did in this movie. He was just plain hilarious as the FBI Agent. I couldn't help but to laugh how he reacted every time a woman raised her voice to him. If you want a good laugh I definitely recommend this movie! You know, Pete, you really should be more confident in your reviews. Your always making excuses for what you like! Don't worry, we'll telly ou when you're wrong... 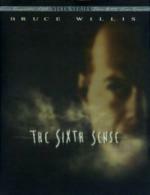 There's nothing wrong with the Sixth Sense and as the others have said it has a strong replay value because I find it as authentic a drama about the boy as a ghost story. LOL... well the reason I said that about The Sixth Sense is because I have read a lot of bad reviews about it when it was first released.... so I took that into account when I wrote my review. Other then that I just usually try to show that I know there is more then one side to every show... those that like it and those that don't. So I guess basically it has just always been the way I am... to make sure that reiterate that it is just my opinion and that I am aware that it is just that.... just my opinion. BTW Jon... I am never wrong.... you may not agree with me... but I am always right! NOTE: This one is for Jon!... I just had to make him shiver and tell me I am wrong! In this edge-of-your seat supernatural thriller featuring Hollywood's hottest stars, a study in fear escalates into a heart-stopping nightmare for a professor and three subjects trapped in a mysterious mansion. For over a century, the dark and forbidding Hill House has sat alone and abandoned... or so it seemed. Intrigued by the mansion's storied past, Dr. Marrow (Liam Neeson) lures his three subjects - Theo (Catherine Zeta-Jones), Nell (Lili Taylor) and Luke (Owen Wilson) - to the site for a seemingly harmless experiment. But, from the moment of their arrival, Nell seems mysteriously drawn to the house... and the attraction is frighteningly mutual. When night descends, the study goes horrifyingly awry as the subjects discover the haunting secrets that live within the walls of Hill House. Don't miss the state-of-the-art special effects as Hill House unleashes its supernatural wrath in this latest thriller from the director of 'Speed' and 'Twister'. This, in my opinion, is a good... and fun haunted house movie. But at the same time I think it is a bit CGI heavy as well. Something I think ghost stories forgot somewhere along the way is what you do not see is always scarier then what you see. I did like Catherine Zeta-Jones as Theo... she was probably my favorite character in the movie. Until recently (this past Halloween) I never seen the original of this movie so was never able to compare the two. But now that I have I can say that I do prefer the original... but this one is good for a "Check you brain at the door... Pop-corn movie."